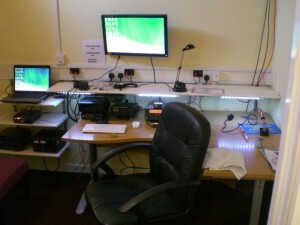 Our shack is set up with radios for HF and VHF/UHF. Recently we have added a second operating station, primarily for VHF/UHF, but it is equipped with an HF/VHF/UHF transceiver to enable multiple HF operations if required. We also have a laptop on hand for digital modes and QRZ.